Optimal working dilutions should be determined experimentally by the investigator. Suggested starting dilutions are as follows: IHC-P (1:100-1:300), IF (1:200-1:1000), ELISA (1:10000). Not yet tested in other applications. The protein encoded by ACO1 is a bifunctional, cytosolic protein that functions as an essential enzyme in the TCA cycle and interacts with mRNA to control the levels of iron inside cells. When cellular iron levels are high, this protein binds to a 4Fe-4S cluster and functions as an aconitase. Aconitases are iron-sulfur proteins that function to catalyze the conversion of citrate to isocitrate. When cellular iron levels are low, the protein binds to iron-responsive elements (IREs), which are stem-loop structures found in the 5' UTR of ferritin mRNA, and in the 3' UTR of transferrin receptor mRNA. When the protein binds to IRE, it results in repression of translation of ferritin mRNA, and inhibition of degradation of the otherwise rapidly degraded transferrin receptor mRNA. The protein encoded by ACO1 has been identified as a moonlighting protein based on its ability to perform mechanistically distinct functions. Alternative splicing results in multiple transcript variants. 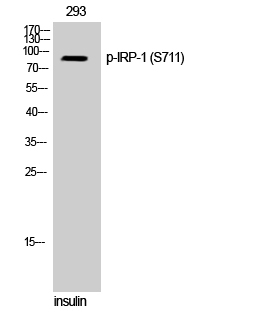 Phospho-IRP-1 (S138) Polyclonal Antibody detects endogenous levels of IRP-1 protein only when phosphorylated at S138.